The Japan Center for International Cooperation in Conservation carries out studies and research concerning the systems for conservation of cultural properties in each country around the world. As one such project, currently it is studying the state of conservation of movable cultural properties in the United States. While the U.S. is home to numerous museums of history and art and holds many of the world’s movable cultural properties, it has no government agency that specializes in the protection and management of cultural properties. Management of cultural properties is left to their owners, and management and regulation at the federal level is not very strong except in emergencies such as major natural disasters. Under these circumstances, management, restoration, and exhibition of moveable cultural properties in the U.S. is handled on an individual basis, in accordance with the management policies of each museum and with the wishes of the properties’ owners. While thinking on cultural properties differs considerably between Japan and the U.S., at the same time the U.S. is home to numerous art museums that hold collections of Japanese art. In addition, the Center’s Cooperative Program for the Conservation of Japanese Art Objects Overseas, begun in 1991, has restored more than 250 works of art at 24 art museums across the United States. Thus, the Center has close ties with American art museums. Accordingly, from January 26 through February 3, 2013 Tomoko EMURA and Asuka SAKAINO conducted a study in Washington, D.C. to ascertain in a systematic way the state of the conservation of movable cultural properties in the United States. 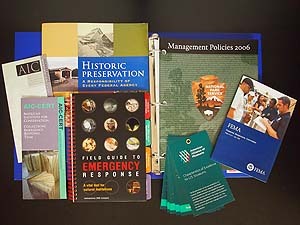 They conducted a number of interviews focusing chiefly on key organizations conducting comprehensive activities to protect cultural properties, including the Federal Emergency Management Agency (FEMA), the National Park Service of the Department of the Interior, the Library of Congress, the American Institute for Conservation (AIC)/Foundation of the American Institute for Conservation (FAIC), the American Alliance of Museums (AAM), and the nonprofit Heritage Preservation. They also studied the state of management of the collections of history and art museums. In particular, they learned about the collection management rules and the state of restoration of works at the Freer Gallery of Art. 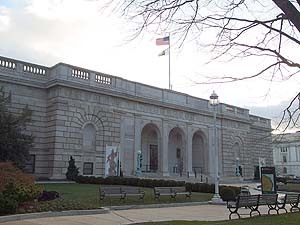 America’s oldest national art museum, the Freer Gallery opened in 1923 and holds numerous works of art from East Asia, including Japan. This study showed that one of the reasons cultural properties in the U.S. are conserved appropriately despite the lack of strict regulations is because of cooperation among individual organizations and personnel along with effective functioning of bottom-up decision-making. Future plans call for advancing more practical study and research looking at the history museums playing central roles in each region of the U.S. and at museums holding works of Japanese art.